It were the sunpot groups (1)1045 and 46 in particular that caused excitement (more coverage here, hier und hier): the Sun on Feb. 15 and Feb. 7, a big prominence and more on Jan. 30/31, a flare on Feb. 12 and a CME on Jan. 27. • From the annular solar eclipse a month ago a video from the Maldives (one of all too few with some editing before posting ...), a video from Varkala, a video from Rameswaran, a report from Kanyakumari and a lightcurve from Dhanushkody. The eclipse is also pic 18 here, seen at sunset from Japan with fine atmospheric effects (Omega phenomenon) and starring in a poorly edited TV clip (more). • For a change, a great amateur Moon picture and another one, both with extremely high resolution. In other news Mars - a report from Mozambique - is still a fine sight, e.g. on Feb. 13, Feb. 9, Feb. 8, Feb. 6, Feb. 4, Feb. 2 (a picture with a 1-m telescope; more on the little dust storm), Feb. 1, Jan. 29 and Jan. 28 (the 1-m again); also a drawing of Jan. 18. • Low in the west, the Jupiter/Venus conjunction is now - while the stellar occultation by Pluto was clouded out all over Europe, it seems, but Pic du Midi reports success. • There may have been a new surge in comet SW 1: pictures of Feb. 8, Feb. 6, Feb. 5 (more from that place, another and another pic), Feb. 3 (more) and a story. 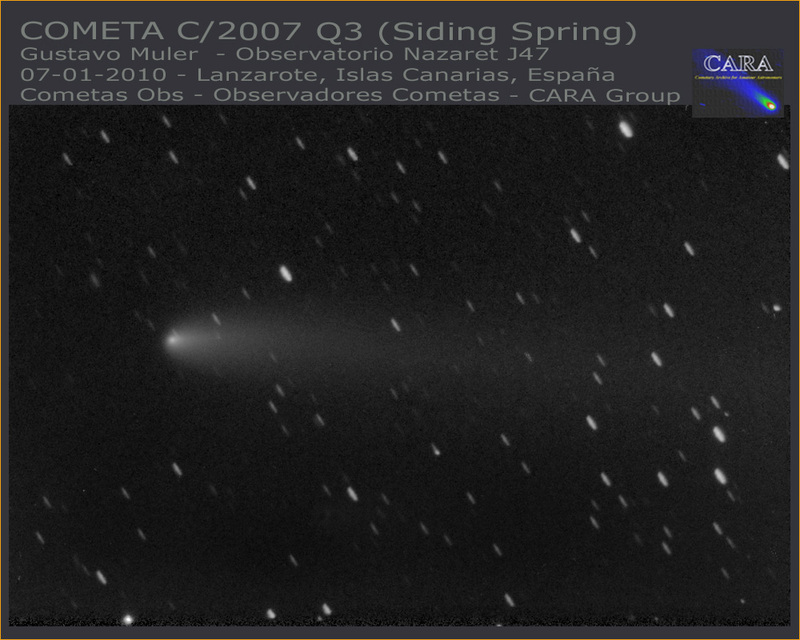 • Also a nice tail of C/2007 Q3, a picture of 2010 A2 with a small scope - and nonsense regarding that object. • There was a bolide in Ireland of which no footage seems to exist (more, more, more, more) - unfortunately an old fake video was accepted by all too many (such as this, this and this site) for the real thing ... • A fireball cloud from last November, another and another story on the fight over the 'doctor's office meteorite' and a possible impact site in Rajasthan. • An incident over Mexico was neither a particular reentry (earlier) nor was there a crater formed: confused coverage here, here, here, here, here and here. • Finally stories on the variable stars U Scorpii (a picture of Feb. 6) and Epsilon Aurigae. And the IAU Circulars are moving to a new - not too distant - place. 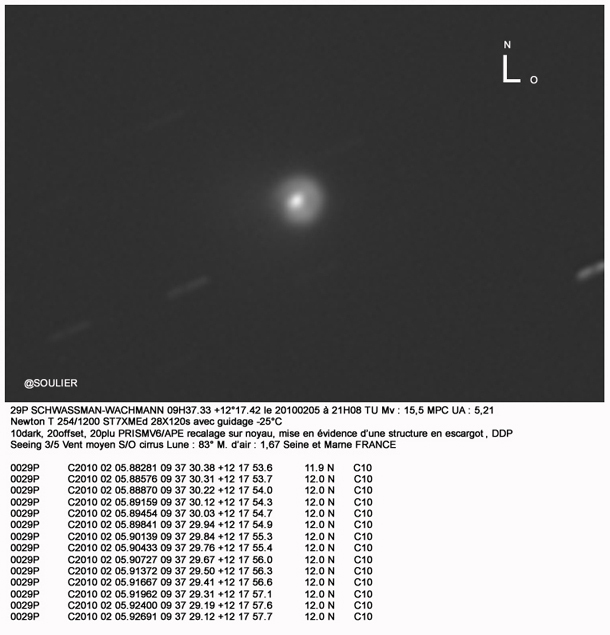 Comet Schwassmann-Wachmann 1 in biggest outburst in a decade? 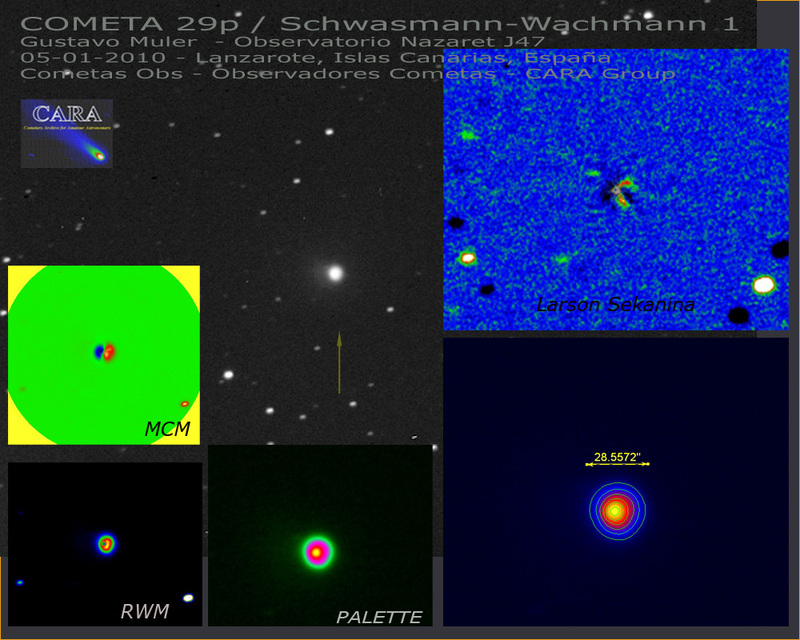 Spanish "data suggest that this comet is currently experiencing an unusual outburst, probably the brightest in the last decade according the recent photometric compilation," says an Astronomer's Telegram today: "Additional observations obtained in the last month suggest a progressive increase in activity from mid January from a quite inactive 40-days period in which the comet remained close to +16 R magnitude." Now the "object exhibits a stellar appearance in the images with an apparent diameter of 15 arcsec. The derived magnitude of the comet in a 10 arcsec standard photometry field is +11.7 R, +11.5 I, and +11.9 V." • Meanwhile a dramatic HST picture of the comet/asteroid collision product C/2010 A2 (mentioned last time) is everywhere and discussed e.g. here, here, here, here, here, here, here, here and here. • All the comets of 2010 are detailled in this document (PDF, 5 pg.). • A minor meteor outburst of the Gamma Ursae Minorids. • And the meteorite hitting a doctor's office in Virginia - also mentioned - is now being fought over as this, this, this and this story report. 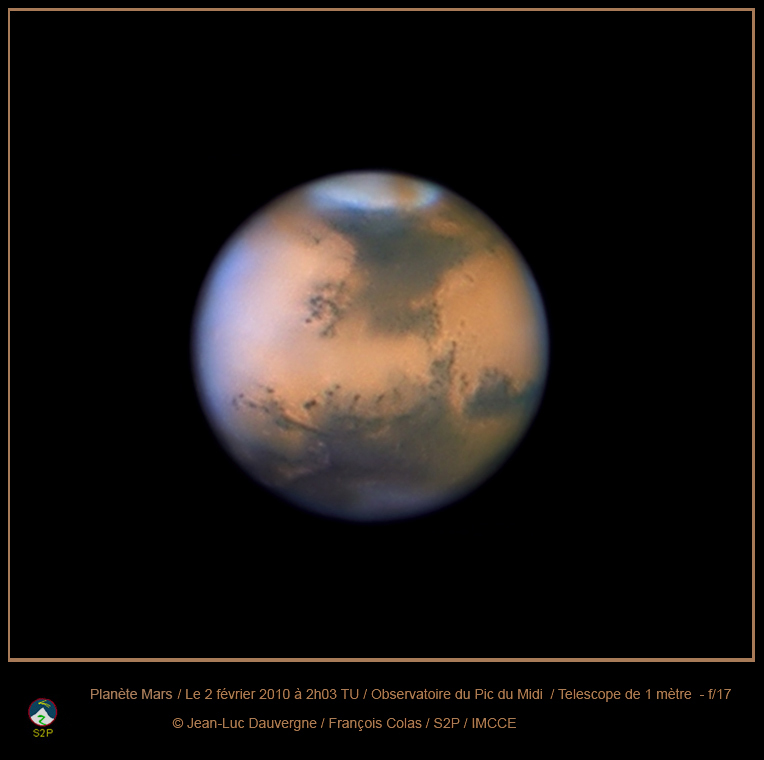 Mars is now in opposition and very bright (as stories here, here and here explain): nice pictures from Feb. 2, Feb. 1, Jan. 30, Jan. 29, Jan. 26/27 (pairwise forming great stereo views, esp. 1+2, 3+4 and 4+5), Jan. 26 (more, more, more, more, more and more), Jan. 23 (more), Jan. 21 and Jan. 5; fresh planet images ago appear in this new gallery. • Pictures of the brightest-of-the-year-full Moon/Mars constellation of Jan. 30 from the Philippines, India (story) and Germany. • Students have recovered a Mars "companion", and asteroid on an horse-shoe orbit. • And a report about a grazing occultation of Antares by the Moon on Jan. 11. Feb. 9: PHA 2009 UN3 comes moderately close to Earth and should reach 12th mag. Feb. 14: Pluto occults a moderately bright star, 11th mag. in the visible, brighter in the (infra-)red, for Europe - a rare event! In other news the recurrent nova U Sco is in outburst, discovered by amateur and the first eruption since 1999 - after studying historical plates this explosion was forecast with some confidence, and a network of observers was alerted; more coverage here, here and here - and X-ray observations by Swift. • The new Nova Sgr has faded fast as has Nova Oph. • And Epsilon Aurigae has reached totality some time in January, but keep watching it for brightness fluctuations! • A picture of NLCs from orbit, twittered by an astronaut, and a strange thing in the sky over China which was probably a rocket test, reminiscent of the one seen from Norway earlier - the latter was a failure, though, the Chinese one apparently a success (and the visual observations valuable). • Finally we learn that the CBAT is moving, to greener (no pun on Dan Green intended :-) pastures.